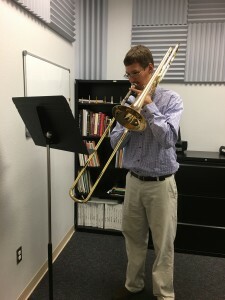 I have previously posted about the advantages of a trombone-specific music stand. It turns out that Manhasset also makes an extra tall stand. At this past year’s Texas Music Educators Association conference, I stopped by the Manhasset booth and asked if they sold an extra tall trombone stand. The company doesn’t, but they pointed out what in hindsight is obvious: stands are delivered in pieces, and so the parts can be mixed and matched during assembly. 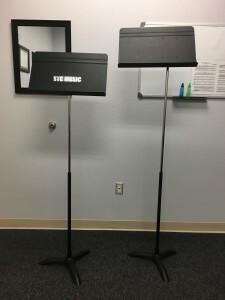 In my institution’s most recent order of music stands, they were kind enough to purchase one extra tall stand as well as one trombone stand. I took the trombone desk and put it on the extra tall post, and I am simply delighted with the results. Here, you can see the height difference between the normal stand (left) and my extra tall stand. I’ve been using it in my practice for about two months, and it has really forced me to notice how my posture has been suffering. When standing straight, I am significantly taller than six feet tall. To use a normal stand, therefore, I either have to place it low and play “jazz style” over the top of the stand, or I have to slouch to see the music. Both have drawbacks, particularly when I’m trying to read new music that I need to look at more carefully. By raising the stand all the way, I am able — actually, I am forced — to stand up straight and stop slouching. This, of course, improves my air flow and my chest resonance. Not to mention, it’s simply healthier and will (ideally) reduce back pain down the line. 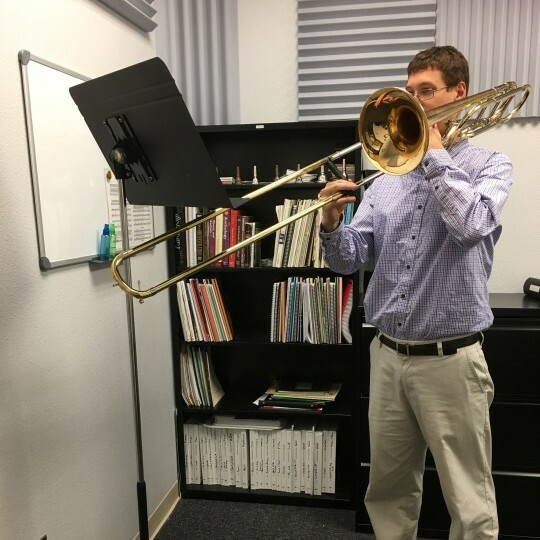 In school, teachers often select the tall kids to play the trombone, because we can reach the lower positions at a younger age. Tall kids usually grow to be tall adults, and a “standard” sized stand doesn’t fit us any better than “normal” sized clothing. In grad school, my teacher would put the music stand on a chair to get it high enough that he was happy with my posture. Because of the awkwardness of this setup, I didn’t replicate this in my practice setup, and now I habitually slouch while playing. This was my mistake for sure, but this stand provides a solution for that problem. The offset desk also makes a huge difference. While I’m happy to put my slide off to the left side of the stand (as many trombonists do), that position makes reading the right page of a book difficult. With the post offset, I can safely put my slide under the middle of the stand and see the whole book without risking toppling the stand and putting dents in my slide when I hit the post. 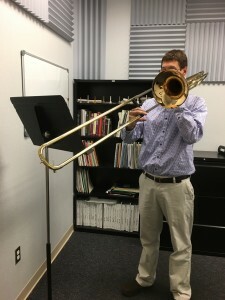 The following images show the discomfort of a tall trombonist using a normal stand, followed by the proper posture allowed by the extra tall trombone stand.